I fell in love with boiled potatoes this summer. I know, it sounds silly, but I was reintroduced to the blank slate that a boiled potato represents. Think of a woman who has an OK body, and then she puts on this fabulous dress and all of a sudden….she’s a goddess. I know, it happens to me all the time. In my dreams! Back to potatoes, a boiled potato is just that…an ok, humdrum affair until you put a bit of sauce on it, and then the potato comes alive and wants to go dancing. 1 clove of garlic, also finely chopped. 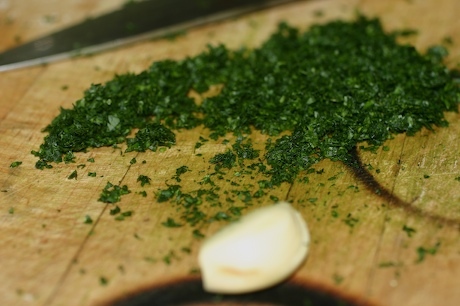 First chop the parsley, then the garlic, and then chop them together to be sure they really know and understand each other. 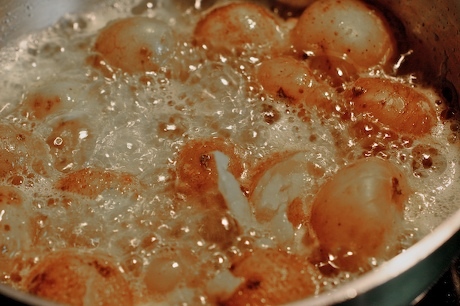 Boil the whole, unpeeled potatoes in salted water until tender. Drain, and when cool enough to handle, cut in half. Melt the butter and let it cook until it turns light brown, using medium heat, we’re making brown butter, not scorched butter. Choose a flat sauté pan that will hold all the potatoes, arranged flat, cut side down. When the butter is a light caramel color, add the potatoes to the pan, face down so that the cut part is in contact with the butter. Sauté on medium heat for 2 minutes, then add the finely chopped parsley and garlic to the potatoes and cook for one more minute. Done! 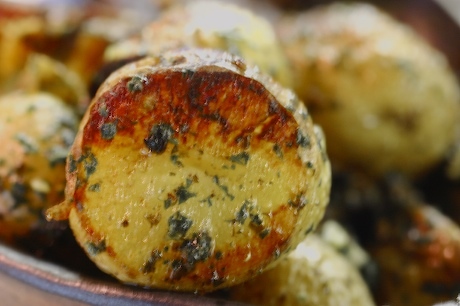 Add a little sea salt after you’ve plated the potatoes if you feel like it. You don’t have to pour the remaining butter over the potatoes, unless you are feeling decadent and luscious.